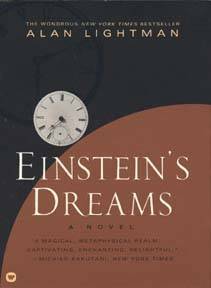 While visiting Half Price Books yesterday, I came across Alan Lightman’s Einstein’s Dreams (1993). Thumbing through it, I was reminded me of Eagleman’s Sum (2009) in that both are collections of witty, dream-like flash fiction tied to a common theme. Where Sum was a meditation on “the afterlives,” Einstein’s Dreams is an imaginative vision of worlds where, in one, cause does not precede effect and, in another, humans have no concept of the future and thus the present forever teeters on The End. With a prologue, three interludes, and an epilogue, the frame narrative for Lightman’s novel is a young Albert Einstein, 1905, having freshly completed his special theory of relativity. On the verge of shattering man’s sense of self and time, each of the thirty stories is a dream in the patent clerk’s head. Some are fantastic and others melancholic. Each causes the reader to pause, reread the last line, and take a deep breath. It’s as if one’s felt an ominous chill in their bones, so the chest tightens; the first flakes of winter confirm what the body already knew. One particular story I enjoyed was “20 May 1905” (each are thus titled). In it there is no memory, and “A world without memory is a world of the present” where everyone is always seeing the world anew. I love this book. I found it by chance in a thrift store and bought it, having never heard of it before. I was pleased with this find.